The Bobby Rea Memorial cross country races took place on Saturday 28th October in Kilbroney Forest Park, Rostrevor. Springwell RC had only one representative in the senior races with Gerry O’Doherty continuing his excellent form and once again winning the M60 category. The Bobby Rea Memorial cross country event incorporates the NI & Ulster Even Age Group cross country championships. In the U18 girls race Niamh Carr had an excellent run to win in 14.39. Hermione Skuce was third with a time of 15.01, and with club mate Elle Beveridge finishing 15th in 16.36 they also won the team event. Sophie Coyle, Niamh McGarry, Niamh Carr, Hermione Skuce, and Andrew Gordon have all qualified for the Irish Championships in Abbotstown in November. The East Antrim Marathon Series held an event on Saturday 28th October to compliment the SSE Airtricity Dublin Marathon on Sunday, where runners were given the opportunity to complete a marathon on both days. 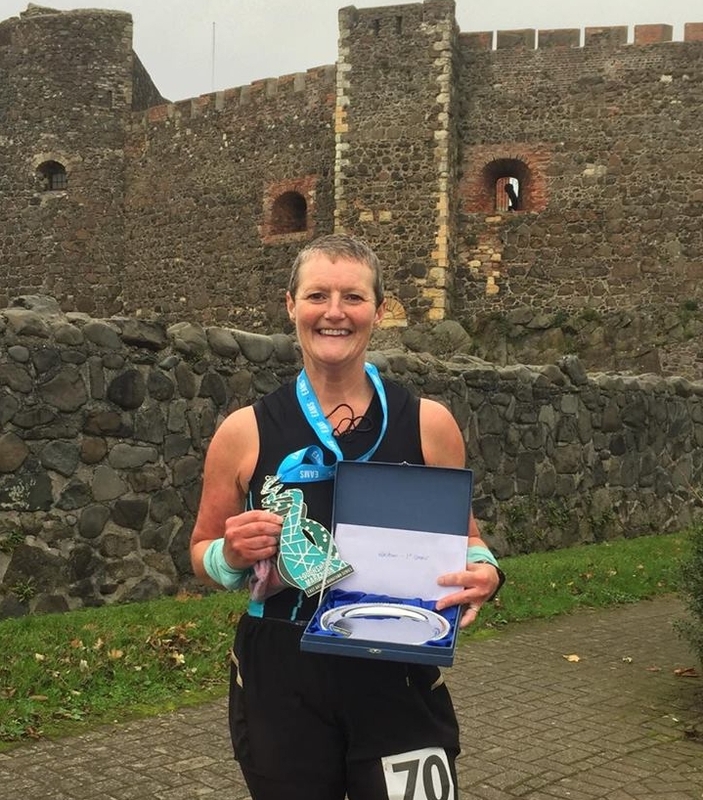 Springwell RC’s Helena Dornan took up the challenge and finished as first lady on Saturday, completing the 26.2 miles in 4.11.44. Helena then travelled to Dublin for Sundays race where she finished 12345th in 4.49.02. Sunday 29th October saw a record number of runners take to the streets of Dublin for the annual SSE Airtricity Marathon. With 20,000 runners taking part Dublin is now the fifth largest biggest marathon in Europe. Kenyan Bernard Rotich won the men's race in a time of 2 hours 15 minutes, while the women's race was won by Nataliya Lehonkova of Ukraine, who finished in a time of 2 hours and 28 minutes. Springwell RC were once again well represented at this event with 43 members taking part, many for the first time. While everyone was running for the challenge some were also running to raise money for a variety of charities. Members ran in support of Causeway Coast Dogs Rescue, the Sands charity and the British Heart Foundation. Springwell RC Results - 646th Stephen Joyce 3.04.54, 667th Anthony Higginbottom 3.05.25, 707th Stephen Fillis 3.06.12 PB, 1337th Dave Sexton 3.17.36, 1791st Ryan Kennedy 3.23.42, 2062nd Conor Burns 3.26.49, 2168th Eddie Clyde 3.27.51, 2379th Richard Ross 3.29.17, 2819th Kerrie McIlmoyle 3.34.02, 3005th Andy Dowey 3.35.56, 3290th Mary Kate Mackle 3.38.26, 3834th Timothy Bacon 3.42.59, 4261st Catherine Pinkerton 3.46.21, 4263rd Gary Moore 3.46.21, 5025th Davy MacNicol 3.51.13, 5323rd Shane Elder 3.53.13 PB, 6131st Stephen Smyth 3.57.57 PB, 6742nd Sarah Dickinson 4.01.25 PB, 7222nd Nigel McNeill 4.05.31, 7283rd Kieran Cooke 4.06.03 PB, 7339th John Butcher 4.06.21, 7677th Paul Quinn 4.08.32, 7863rd Laura Wilson 4.10.00 PB, 8489th Peter Butcher 4.14.41, 8482nd Bob Purcell 4.14.43, 8703rd Carolyn Crawford 4.16.30 PB, 9036th Jean Claude Bourgeois 4.18.42, 9419th Noel Harkin 4.21.45, 9622nd Louise Hanna 4.23.29, 10040th Ali McAllister 4.26.34, 10003rd Stephen Cassidy 4.26.16, 10169th Joanne Diamond 4.27.36, 10173rd Brenda Burns 4.27.37 PB, 12180th Andrew Kincaid 4.47.34, 12345th Helena Dornan 4.49.02, 12617th Mark Neely 4.52.19, 12786th Kathy Donaghey 4.54.27 PB, 14233rd Colin Connolly 5.22.28 PB, 14253rd Hayley Neely 5.23.04, 14269th Fergal Mackle 5.23.04, 14274th Paul Humphreys 5.23.30, 14805th Andrew Wilmot 5.40.56, 15040th Aidan Mooney 5.51.31. Saturday’s Parkruns saw 47 Springwell RC members taking part at nine different venues with one personal best being recorded.